Shri Chandramouleswara Swamy Temple is located in Rishikesh, a holy city in Dehradun district, Uttarakhand, India. The main deity of the temple is Lord Sri Chandramouleshwara Swamy(Lord Shiva). The main festivals of this temple are MahaShivaratri, Karthika Masam and ANNUAL BRAHMOTSAVAMS. TTD has taken initiative and started to conduct annual brahmotsavams for the first time for a period of 5days from the year 2014 onwards. 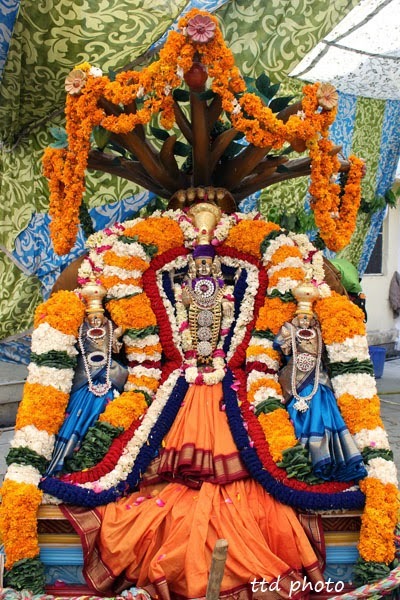 The 5-day annual brahmotsavam festival in the year 2015 begins on May 13, 2015(Wednesday) with Ankurarpanam and concludes on May 18, 2015(Monday) with Ravanasura Vahanam and Dwajaavarohanam. The procession deities Lord Sri Chandramouleswara Swamy along with His consorts Goddess Ganga Devi and Goddess Parvathi Devi take a celestial ride on divine Vahanas along temple streets in all days during brahmotsavams to witness the thousands of devotees. On this auspicious occasion, a wide range of cultural and spiritual programs are going to be conducted jointly by TTD and Hindu Dharma Prachara Parishad during the festival period.